If you’re interested in learning about sustainable living, green design, abundant gardening, organic agriculture, generating renewable energy, healthy nutrition and learn new skills, then you will get much from this course. When a permaculture design is implemented on the land, in a business, in community or in one’s own personal life, wastes become resources, yields increase and the environment is restored. 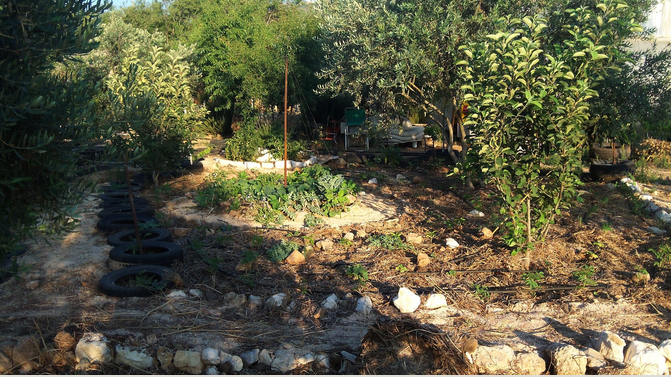 Join us for the 2018 Permaculture Design Course at Marda Permaculture Farm in Palestine from 20th of April to May 1st. Pre-Register here. On this website we wish to introduce you to the Marda Permaculture Farm. We invite you to visit us, to join in our work, learn new things, and spread the word. Palestine faces problems, and Marda Farm brings new solutions. Come and see how it’s done. Marda Permaculture Farm is a haven of green in a land that is dry, where Palestinians live under great hardship, yet where there is a promise of a new future. We believe that permaculture is a key ingredient in our vision for a just future, not only for Palestine, but for the Middle East and the world. We’re setting out to show how it’s done. Look through the pages to find out more.